After a quick jaunt back through Shanghai, I returned to my favorite city on earth: Hong Kong, my Hong Kong! And words don’t describe how good it felt. If Hong Kong was fun while I was single, it could only get better by bringing my boyfriend Sean with me, and man was I right. It wasn’t just fun, it turned into an epic tale. Don’t miss this story! 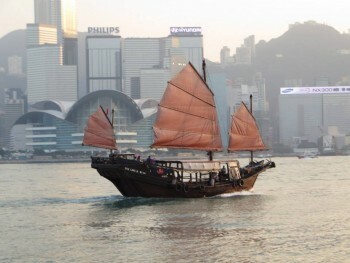 A traditional sampan still sailing along in the Hong Kong harbor. Sean and I were up at the crack of dawn for our 9 AM flight from Shanghai to Hong Kong, but it was well worth it when we arrived in the Hong Kong Airport and I took in (and pointed out) everything on the cab ride from the airport to our hotel in Tsim Sha Tsui: the Sheraton Hong Kong Hotel and Towers. Once again, showering, clean clothes and food were top priorities, but afterward we walked along the Avenue of Stars, looked at Victoria Harbor and the Star Ferries and sampans sailing along, and I gave Sean his first taste of Nathan Rd (one of the most opulent shopping streets in the world). Sean and Bruce, just chilling on the Avenue of Stars. Our friend David was also coming to Hong Kong on business at the same time we were there, so we ended up hanging out a good bit of the time. We met for dinner that first night at his favorite sushi restaurant in Causeway Bay, Sushi One. 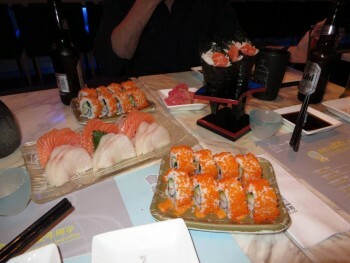 I can’t even tell you how tasty it was – fresh rolls, fresh fish, strong sake, and at a great price! It’s no wonder he told us he goes back for at least one meal every time he’s in Hong Kong. We also went around the corner to a British pub for a couple of drinks, before Sean and I finally couldn’t stay awake much longer and headed back to our side of the island via the MTR.The next day, Sean and I bought tickets for the Big Bus Tour: Hong Kong, to really make the most of the last two days we had in Asia and get the most out of the city. It turned out to be a great move. The tour had three different routes you could take and each one hit different spots of interest in Hong Kong, and was narrated by a pre-recorded audio guide, so no matter what language a tourist spoke, they could understand what was going on. It was incredibly informative (I really don’t know why I didn’t do something like this the first time I was in Hong Kong for a semester), and a great way to see so many highlights in a short period of time. Some of the best sushi I’ve ever had in Hong Kong at Sushi One in Causeway Bay. The first tour we took, brought us around the central part of Hong Kong. We saw some of the tallest towers in the city, Times Square, Central, Lan Kwai Fung (where we would return after dark), and a number of other spots, including the highlight: Victoria’s Peak. The most famous mountain in Hong Kong that has a tram running from top to bottom, and some of the most breathtaking views of the city on a clear day. And we had a clear day. The crush of people waiting in line was impressive, but Sean and I persevered and were rewarded with the postcard perfect views I remembered. Neither words nor pictures do it justice – it just has to be experienced to be truly appreciated. When we came back down, we hurried back to TST to watch the Symphony of Lights – a twenty-minute laser light show that happens every night over the harbor. Many of the buildings are lit up at night and during the show, the lights are programmed in time with the music to flash on and off, change colors, etc. For a free show, it’s pretty cool. Then it was off to a traditional Cantonese restaurant for dinner called, Fu Sing, before meeting up with David and a friend of his who lives in Hong Kong, Kai, in LKF. 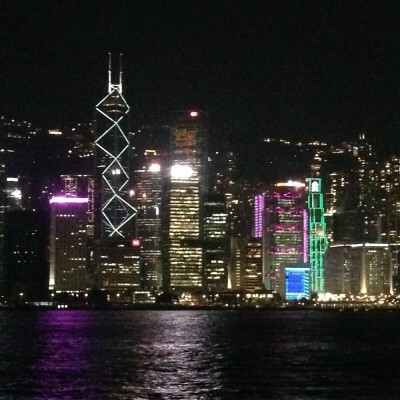 The Hong Kong skyline from Victoria Harbor at night. One of my favorite views in the world. Our night in LKF was in one word: epic. 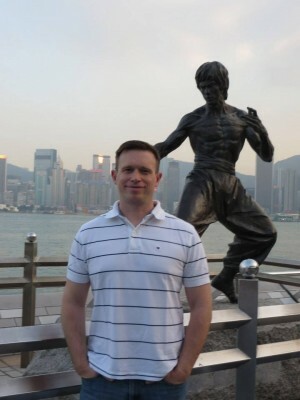 It started off tamely enough with a few drinks at Hong Kong Brew House, but I was intent on dancing that night at the numerous clubs packed into the tiny square that comprises Lan Kwai Fung. Soon we were journeying up the hill with other groups of semi-sober people in search of dancing music. We ended up in China Bar (not once but twice that night), the drinks started flowing, the shots appeared, the music pumped and the fun really began. Fast forward three hours later and a group of three German girls had joined the party, a bottle of champagne had materialized from somewhere, two girls in cat suits with laser wands appeared briefly (no joke) and we were all half deaf and done in for the night. Sean and I caught a cab back to our hotel and stumbled into bed just after 4 AM, exhausted but alive. Like I said: epic. And that was just our first full day in Hong Kong. If you thought this was wild, just wait for the next installment. Sean’s most epic photobomb ever, and a look of joy that’s unrivaled. Here’s to you, Hong Kong. Photo courtesy of David East. This entry was posted in Asia, Hong Kong and tagged Asia, Cat suits, Club, Dance, Hong Kong, LKF, Photobomb, sushi, Travels, Victoria's Peak on July 10, 2014 by Paige N..